Memorial Day in a special day for Americans to honor and remember soldiers who have died in wars. 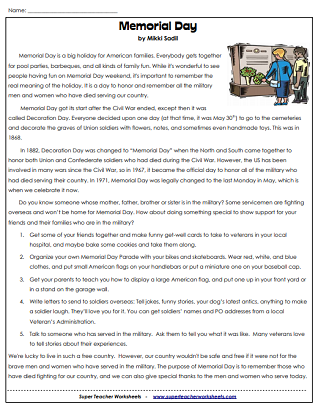 This page contains an article about the history of Memorial Day and printable worksheets. Learn about the history of Memorial Day with this informative article. This printable also includes reading comprehension questions. 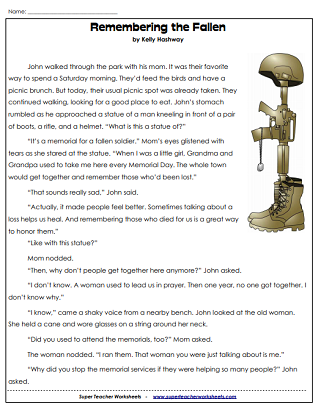 John wants to have a picnic in the park like most Saturdays, but when his usual spot is taken, he and his mom end up by a statue dedicated to fallen soldiers. John learns about a Memorial Day service that has long been forgotten. But when he meets a special woman who knows about the service, he's determine to bring the tradition back. Jason wants to hear all about Grandpa Bill's job in the Army during the Vietnam War. When Grandpa Bill shares his experiences, Jason learns that his Grandpa is a war hero! This poem teaches kids about the symbolism of the American flag. 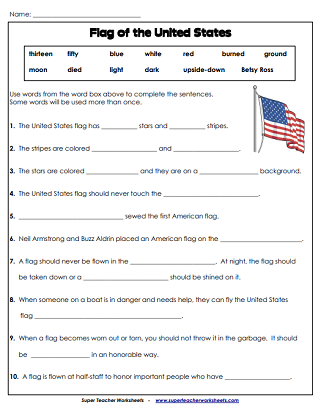 Use words from the word bank to complete each sentence about the US flag. This is a large outline picture of the American flag. Color "Old Glory" using the correct colors in the correct areas. We have worksheets for almost every holiday! Take a look. Worksheets with Patriotic Symbols such as American flag, bald eagle and more. Our Veterans Day worksheets are here to help teach children about this day.